Kyoto is both beautifully traditional and ultra-modern. This city of contrasts is bursting with colour, rich in history and packed with things to do and see, making it one of the most exciting destinations to visit in Japan. After all, where else can you glimpse a geisha, feed wild monkeys and have tea with Hello Kitty all in the same day? Much like the city itself, Kyoto’s hostels vary from old to new. You’ll find traditional Japanese ryokans with sliding doors and futon beds, innovative capsule rooms that verge on futuristic and quirky themed hostels with wonderfully niche concepts. Intrigued yet? Japan may be more expensive than other Asian backpacking hotspots, but it’s made affordable by a great-value transport system, a plethora of cheap eats and, of course, hundreds of amazing hostels. Kyoto has hostels from £11 a night, so whether you choose to base yourself among the hustle and bustle downtown or in the glamorous geisha district Gion, you’ll be able to put a roof over your head without breaking the bank. Here’s our pick of the best hostels in Kyoto! So, you’re a lone wolf, backpacking this unique and fascinating country all on your own. But it doesn’t have to be that way! Stay in one of these super social Kyoto hostels for a familial atmosphere and guaranteed #friendshipgoals. When a hostel team is made up of backpackers, you can be sure they’ll know a thing or two about connecting solo travellers. 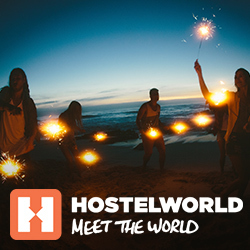 That’s why they put on ‘more events and activities than any other hostel in Japan’ – the perfect way to immerse yourself in local experiences while getting to know your dorm buddies! When you get back to the hostel, the roof terrace is the place to carry on socialising, where you’ll meet and swap stories with people from around the world. Ah, beer – conversation starter, inhibition lowerer, banter enhancer. It’s truly the solo traveller’s best friend; especially when it’s free, as it is at 6pm every evening at this hostel! The vibes in their communal areas are warm and welcoming, so it won’t be long before some serious backpacker bonding is underway. In the morning, save money with their amazing all you can eat breakfast that includes everything from pancakes to fried rice. No boring bread and butter here! As a backpacking couple, you probably want a bit of privacy and downtime without having to compromise on location or atmosphere, right? That’s where these hostels come in; they’ve got the best of both worlds and couples love them! This artsy Kyoto hostel has a rustic aesthetic and a totally chilled ambience. Foodie couples will love it for its fantastic café/restaurant, serving up delicious Japanese and Western dishes all day long. You’ll benefit from an ideal location just minutes’ walk from some of Kyoto’s best attractions and be able to dance the saké-fuelled night away in their vintage-style bar, all while having the luxury of your own private room to retire to! Hostel Ebi says it’s for travellers looking for a ‘cosy and friendly hostel’ over ‘big chain accommodation’. It’s a small place with only twenty beds, and the owner, Jiwon, treats his guests like family; with communal meals and drinks in the living room every day and insider recommendations to help you experience Kyoto like a local. It’s located in the same building as an Irish pub and just one minute’s walk from the famous Nishiki Market, so it’s safe to say that you won’t go hungry or thirsty when staying here! Japan doesn’t do ‘party hostels’ in the same way as Thailand or Australia. That said, the Japanese certainly know how to drink and there are some hostels where you’ll be encouraged to embrace your wild side. These are the best ones in Kyoto to get your party on – and nurse that sore head the next day! What’s a party without friends? Friends Kyo is located in the heart of Gion, the city’s main entertainment district. In the words of the hostel: you probably can’t afford to party with geishas, but you can certainly party here! The rooftop garden is a good place to start, before you make the 5-minute walk to some of Kyoto’s liveliest clubs with some new companions in tow. And don’t worry about being woken up when you finally get to bed; each dorm bed is separated by walls to maintain your privacy – and beauty sleep! When a hostel has a near-perfect score from over 10,000 guest reviews, you know it’s a good’un. In fact, they’re regular Hoscar winners too! Our guests love getting the party started at K’s House. If you haven’t tried saké yet, head down to their backpacker’s bar to get acquainted with the iconic Japanese rice wine. It would be rude not to sample a few cocktails too! Saké hangovers can be lethal, but K’s provide a western style breakfast every morning to aid your recovery. If you’ve got a bit of extra cash to splash, treating yourself to one of these hostels’ private rooms could provide a nice break from shared accommodation. We love staying in dorms, but every now and then it’s important to have a catch up with number one! You just need to take one look at this hostel to know you’ll be in for a cosy stay – and that’s before you’ve even stepped foot in your comfy private bedroom! Our guests love its outstanding facilities and impeccable cleanliness. Its location in Kyoto’s hip downtown area is perfect for anyone who wants to experience the best of the city’s nightlife, as well as the many unique cultural experiences and museums on offer. Kyoto Hana describes itself as a ‘Japanese ryokan meets western backpacker’s hostel’. Their top-notch dorms will be similar to ones you’ve slept in before, but it’s their private rooms that follow Japanese tradition, with tatami mats, futon bedding and sliding doors for an authentic guesthouse experience. Located on a quiet street just 5 minutes from Kyoto Station, this hostel sits among some of Kyoto’s best bars, restaurants and karaoke rooms. When you want to venture further, bicycle rental is available for under £5. Luxury freebies – from hairdryers to green tea! Downtown Kyoto is where you’ll find the highest concentration of bars, clubs, restaurants, markets, shops, and most importantly… hostels! While most sightseeing destinations are a little further out of the centre, downtown is the place to stay if you’re a social butterfly who wants the city’s best nightlife and food options on your doorstep. The concept of this downtown hostel is probably unlike any accommodation you’ve experienced before. At check-in you’ll be given an iPod, with an app that controls all the functions of your spacious pod-style room. For instance, you can transform your bed into a sofa to give yourself room to change, or set the lights to gradually turn on in the morning to wake you peacefully without a sound. When you’re done marvelling at the wonders of technology, make your way down to the bar at 17:30 to enjoy an hour of free pour-your-own draft beer! This stunning hostel will please the flashiest of flashpackers. We know that life on the road can be tiring, so what better place to rejuvenate after a long day exploring Kyoto than in your hostel’s very own spa/bathhouse? And if that isn’t enough, each of their luxury dorm rooms feature traditional Japanese-style sliding doors on every bed for total privacy, as well as personal TVs to catch up on all your favourite Japanese shows – or at least sharpen your language skills! Lovers of comics and manga, have we got the hostel for you! This unique themed hostel features an immense library with over 30,000 comic books, so you’ll never be short of reading material here. Relax on a beanbag in the peaceful common area and enjoy an eclectic range of comics that you won’t find elsewhere. Its modern dorms are comfy and clean, and although the hostel is quiet its prime location in Nakagyo Ward means it’s surrounded by all kinds of zany entertainment options. Massive comic book collection – obviously! Piece Hostel was awarded best hostel in Japan at our 2018 Hoscars – an impressive title indeed! This ultra-stylish abode is in a quaint, quiet neighbourhood that’s an easy walk to Kyoto’s best attractions. It features top of the range kitchen facilities, free to use iMacs, cosy dorms and stylish private rooms. Our guests recommend their Japanese breakfast, consisting of breads, potato salad, rice and miso soup, served free every morning. They also love the staff, who they say ‘go above and beyond’ to provide local expertise and a fun, welcoming atmosphere. The post The best hostels in Kyoto appeared first on Hostelworld Blog.